Networking In Phoenix AZ. 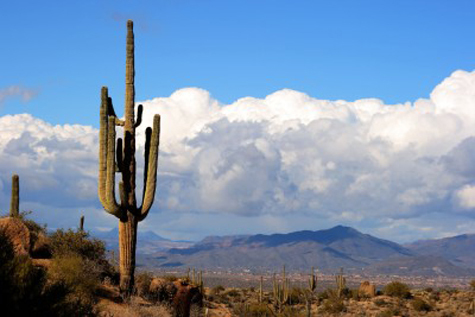 I am in Phoenix, Arizona networking with other online home business owners to increase my profits from my Internet home business. One of the great things about having an Site Build It business is that I am able to work from anywhere, with just my laptop and a digital camera. 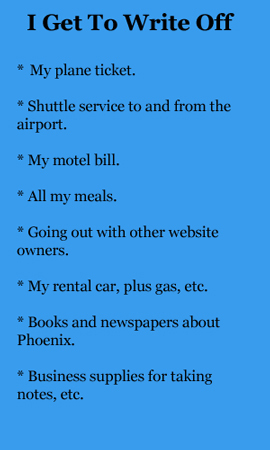 Plus, because I run a legitimate home business, (this travel site, for instance) I qualify for the same tax deductions that are guaranteed by law for doctors, attorneys, and all small business owners. These tax deductions for a home business save me $1000's of dollars each year, and essentially allow me to travel for FREE. Tell me, what could be better than traveling wherever I want, chasing cool pleasant temperatures, working from a patio, pool, or park picnic table...and having the United States government cover my expenses? Sadly, many SBI owners leave money on the table when it comes to keeping more of what they legitimately earn by not understanding that these laws are put in place to help them succeed. Checkout all of the tax write-offs I am allowed to take. If you decided you could make a website as good (or even better than this one) you would automatically qualify, too. 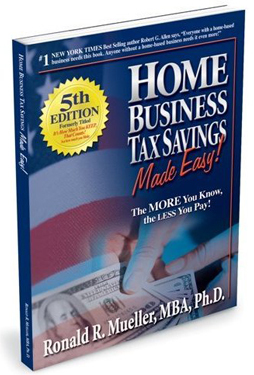 I learned all of this simply by purchasing an easy-to-understand eBook and CD program by Dr. Ron Mueller, and discussing it with the Enrolled Agent who does my taxes. A trip like this for you would cost a couple of thousand dollars, I pretty much got it for free. 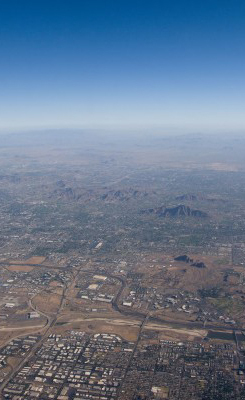 Let me be the first to tell you, Phoenix AZ is a huge, sprawling city. There are over 4 million people...and I think every one of them is old enough to drive. It is HOT most of the year (June, July, August, and September are all close to 105+ almost everyday.) Don't believe that nonsense that "...but it is a dry heat..." so is a microwave, and I would not want to be stuck inside one of those for 120 straight days. It can also be very dusty, compared to the beach paradise where I live here near Treasure Island. Like I said, the only reason I came up here was to get some ideas from other guys I know who profit from Amazon and ClickBank products on their sites. When you travel to Phoenix, make sure it is in the months November - April. During this time, the sun is warm, the humidity is about 7%, and there are gentle breezes. I love running at sunrise, here, when it is quiet, still, and dry. 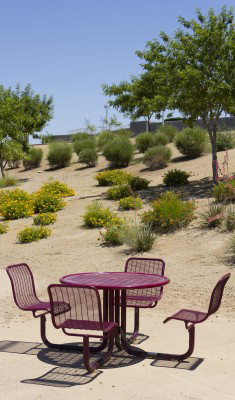 I love the outdoors, and there are plenty of parks and restaurants with outside seating to have a casual business meeting. Discussing ways to better present our Amazon.com and ClickBank products is a lot nicer out in the open air. It seems like there is more freshness to ideas, less complaining about slow business, and more innovative ways of marketing our sites. I enjoy all my travels...especially because they are about 95% free. Trust me, this is something you can do, also. Becoming a travel writer on your own blog/website is not that difficult. Still, when all is said and done, there is nothing like returning to the laid back Gulf Beaches west of St Pete. I like getting away, and making money while I snooze in different nice motels/resorts, but waking up to the sound of waves and smelling the clean salt of Paradise cannot be beat. Networking in Phoenix AZ will help me become even more profitable, but living the Florida beach lifestyle is where my heart truly lies. Keep $1000's of dollars MORE of your own money! CLICK HERE.